TrendyBlendy is a fresh, flirty, and feminine online store that focuses on having wardrobe essentials. They carry versatile pieces (one thing I love about them!) that can be styled in many ways. It was their mission statement that inspired these three different looks using their jeggings. They are also offering my readers 20% off their first order with the promo code: "CONNNIEFIRST". This promo code is valid until the end of June 2013. This look is great for going to work or any activity where you have to be on your feet for a long period of time. The booties add comfort and when pairing them with slim jeans (or jeggings in our case), it elongates your body and creates a streamline shape. Steal: A Wear T-Shirt in Lantern Print from ASOS, here. Splurge: Vintage Cotton Tee in Sea Horse from J.Crew, here. Steal: Scuba Peplum Jacket from Forever 21, here. Splurge: Labworks Peplum Jacket from Target, here. Steal: Fold Over Quilted Clutch from DailyLook, here. 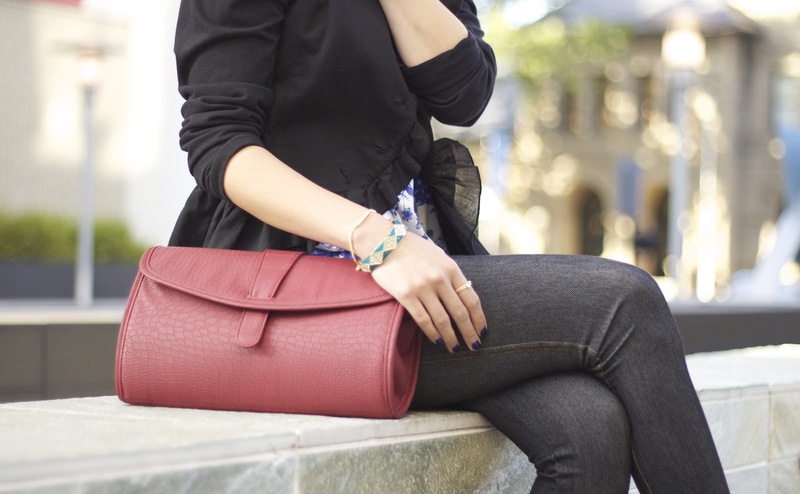 Splurge: Alex Quilted Crossbody Clutch by Linea Pelle, here. 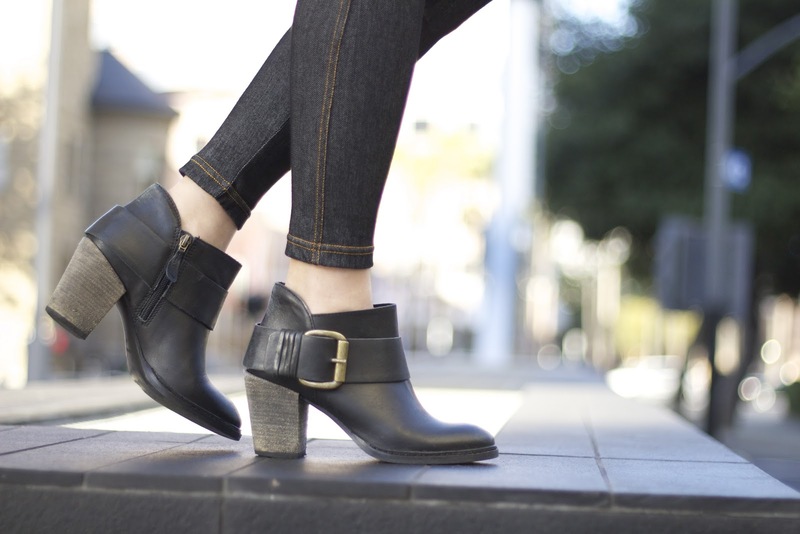 Steal: Buckled Up Ankle Boots from DailyLook, here. Splurge: Plazma from Steve Madden, here. Look 2 is in between dressing up and down. This outfit can be very feminine with the gold sequin top and leopard detail popping out of the leather jacket (yes, thats the actual inner lining), but by adding the leather jacket on top, the tough aspect helps balance out the outfit. Steal: Sequin Boxy Top from bebe, here. 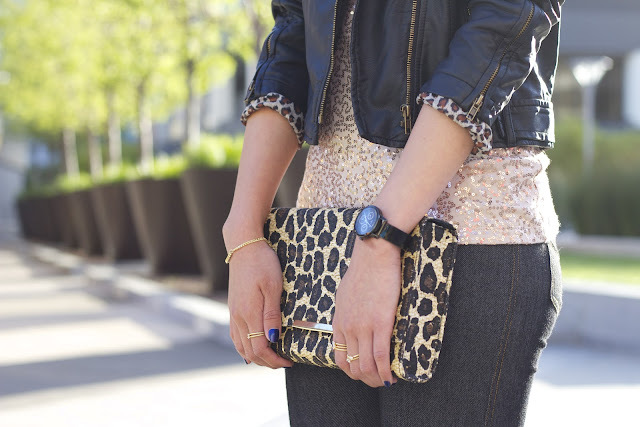 Splurge: Cluster Sequin Tee from J.Crew, here. Steal: Cool Nights Moto Jacket in Black from DailyLook, here. Splurge: Oversized Mesh Envelope Clutch from bebe, here. Steal: Side Zipper Peep Tow Bootie from DailyLook, here. Splurge: Angela Ankle Bootie from Sole Society, here. This look is a creative challenge in a creative challenge. :) This top is actually a dress! I tucked in the ends of the mauve dress into the jeggings to create a peplum top look. In future looks, I will probably wear this as a dress, but I thought it looks pretty great as a top. I love the detail on the sleeves and the wrap-like front. This look is more dressy and would be perfect for going out on a date, seeing a show, or any evening activities. Steal: New Girl Courage Top in Rose from ModCloth, here. Splurge: Hayden from Bluefly, here. Splurge: Linked Leaf Bracelet from ASOS, here. Steal: Mini On The Go Structured Handbag from DailyLook, here. Splurge: Celine Black Leather Luggage Tote. I hope you guys like this post and I hope it inspires you to dress up and down even the simplest item in your closet. 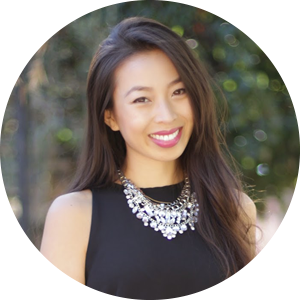 Also congratulations to Kerry Kuang for winning my StyleSofia peplum skirt giveaway. You will be contacted soon. i love your third look, thats soo creative! love those kind of posts, i've seen so many fashion bloggers that never repeats one piece of clothes, but this way sounds more real. i'm loving all these outfits you came up with! great post! where is your watch from in look 2? I have been looking for a watch that I would actually wear and I love yours! 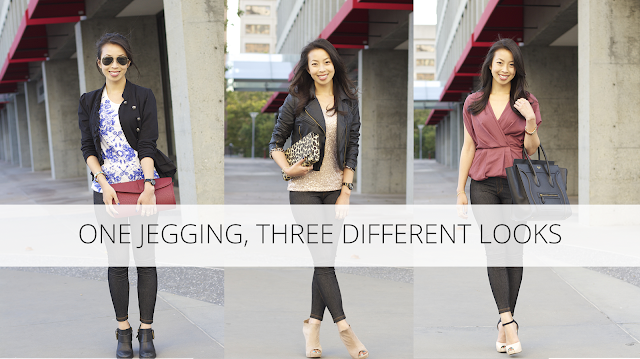 Love all the ways you wear your jeggings! I love all your jeggings looks! they're actually really comfy and you show that you can make them look really classy!